Cassia Obovata Powder which is also known as Neutral Henna or Colorless Henna is a hair conditioning herb, an effective application for treating scalp problems. Cassia Obovata works as an anti-gray hair treatment if mixed with acid juice. It promotes healthy, soft and shining hair and is also reputed to help clear dandruff. It is very useful for those who like to use henna for natural conditioning without changing their natural color. Apart from its properties and uses this form of henna is very cost effective. 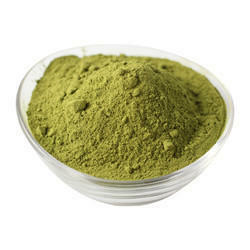 Cassia obovata is also known as clear henna, white henna or colorless henna. We “ Babu Ram Dharam Prakash” are an eminent entity affianced in Manufacturing, Exporting and Supplying a wide range of Mehandi Cone, Henna Powder, Henna Based Hair Colors, Hair Care Products, Natural Henna Leaves, Skin Care Products, etc. Incorporated as a Partnership firm in the year 2012 at Faridabad (Haryana, India), we are involved in offering quality assured array of products. Our mentor, “Mr. Vipin Goyal” has immense experience in this industry and under his worthy guidance we have achieved a prominent position in this industry. We are offering our products under the brand name Inaya, Ellena, etc.